These Four Fantastic Recipes for Chipotle Chicken Tacos are easy, flavorful, and delicious, and chicken tacos would be perfect for your Taco Tuesday dinner tomorrow! All these chicken tacos are simple to put together using the Instant Pot or the slow cooker; take your choice on the method! Click here to PIN Four Fantastic Recipes for Chipotle Chicken Tacos! Chipotle Peppers are smoke-dried Jalapenos, and chicken with Chipotle flavors is always so tasty. 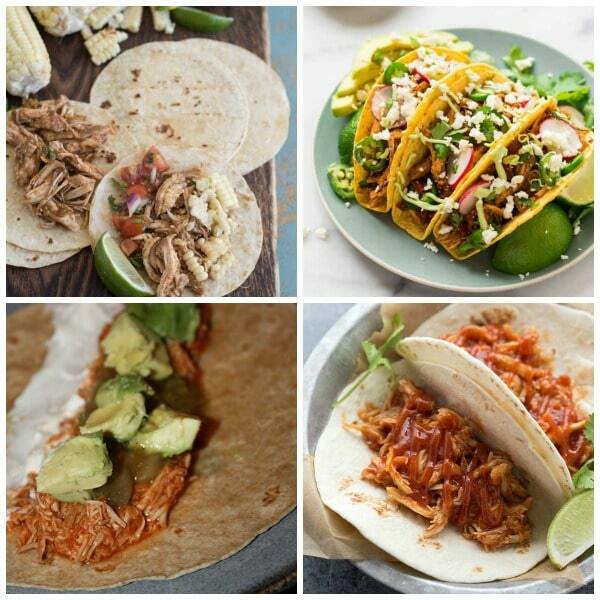 And we’re updating this collection of Four Fantastic Recipes for Chipotle Chicken Tacos to include recipes for both the Instant Pot and slow cooker, and anyone who likes Chipotle flavors and chicken tacos will enjoy these recipes. There are Chipotle Chicken Tacos here made with flour or corn tortillas, and tacos using a variety of tasty toppings like lettuce, tomatoes, onions, salsa, cheese, Jalapenos, sour cream, and a squeeze of lime. And don’t forget the avocado for that creamy, cooling factor that balances out the spiciness of the chipotle flavors. This spicy shredded chipotle chicken would also be great wrapped in a burrito, stuffed in an enchilada, or topping a rice bowl. And, if you have leftovers, you can stash some away in the freezer for a later meal. So pull out your Instant Pot or slow cooker and give Chipotle Chicken Tacos a try for dinner tonight! Instant Pot Shredded Chicken Tacos from Well Plated combines chicken breast, tomatoes, onion, spices, and a few chipotle peppers to create easy, juicy pressure cooker Mexican chicken that’s healthy, full of flavor, and cooks in less than 20 minutes. Slow Cooker Honey Chipotle Chicken Tacos from Chelsea’s Messy Apron are delicious and made so easy with the slow cooker. The chicken cooks first in the slow cooker for 4-6 hours on high or 6-8 hours on low. Once the chicken is completely cooked, and it shreds easily with two forks, you can mix it with the sweet chipotle sauce and let the party begin! Yum! Instant Pot Chipotle Chicken Taco Meat from Bless This Mess has just six simple ingredients, packs a ton of flavor, and takes just 25 minutes in the Instant Pot from start to finish. Melissa says “I prefer to use boneless skinless chicken thighs for this recipe because I think they stay more tender and moist. It did work great with chicken breast too, though, so use what you have on hand.” She has also included directions for the slow cooker if you prefer to use that method of cooking. Slow Cooker Chipotle Chicken Tacos from Kiss My Whisk start with homemade chipotle sauce which might take a little more effort but the results are well worth it! As this Chipotle Chicken is cooking in the slow cooker you can be doing yard work, cleaning the house, or just relaxing. When you come back to it in about six hours dinner will be ready to serve. Oh yes, this looks like another recipe I'll have to try over the weekend. I love making shredded chicken in the slow cooker, and keeping it in the freezer for quick weeknight dinners. Lydia, I'm all over this one too! I made this recipe this past weekend – we loved it! Went a little heavier on the chipotle because we love the heat. Served it with guacamole, tomatillo salsa and a Bobby Flay Mexican slaw recipe. This is a keeper! Thanks Dierdre, so glad you enjoyed it!